Next June, another class of Atlantic City boxing royalty will be honored in the city by the sea. 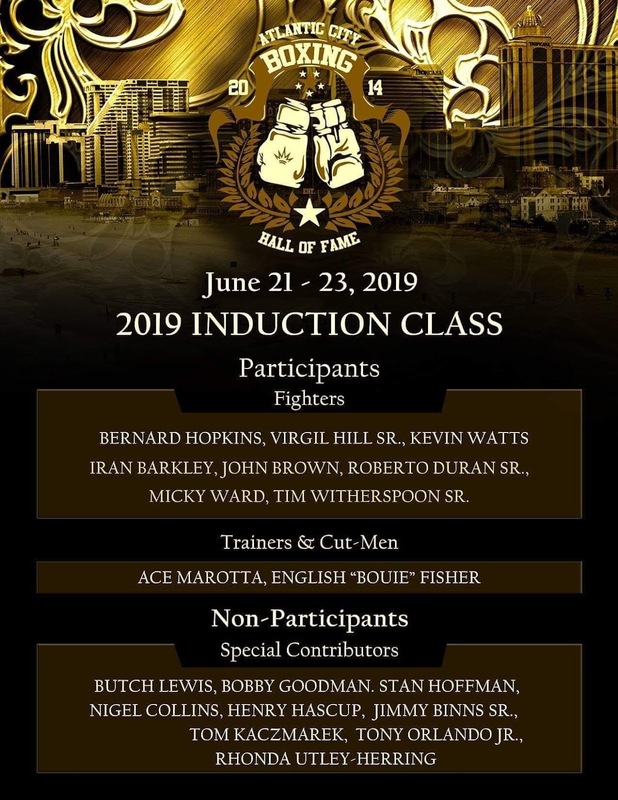 The 2019 class of the Atlantic City Boxing Hall of Fame, which was recently announced by ACBHOF President Ray McCline, will honor a 19 inductee class which includes eight former fighters, two trainers and cut men, and nine special contributors who had a lasting impact on Atlantic City's rich boxing history. The last two induction weekends have been nothing short of fantastic, and have provided fans of the sweet science with the opportunity to interact with boxing stars over the course of three days of festivities and events. 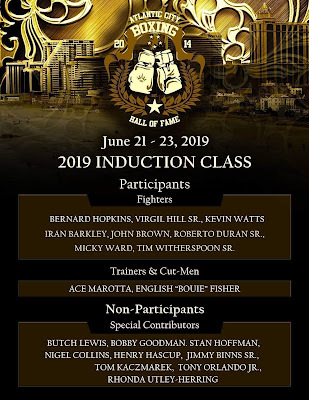 We anticipate that this year's induction weekend will exceed all expectations with yet another great class of inductees entering the ACFBHOF. If the following list doesn't get you excited for next year's induction weekend, I don't know what will! Bernard Hopkins - If you have followed professional boxing over the last 30 years, you should be familiar with this former world champion from Philadelphia. Hopkins fought up to the "ripe old age" of 51, and up until his retirement in 2016, was still considered in boxing circles to be a contender for the world light heavyweight title. "The Executioner," and later "The Alien," fought against a "who's who" list of top notch fighters in the middleweight and light heavyweight divisions over the course of his long career including Roy Jones Jr., Glen Johnson, Simon Brown, Félix Trinidad, Oscar De La Hoya, Jermain Taylor, Antonio Tarver, Winky Wright, Joe Calzaghe, Kelly Pavlik, Jean Pascal, Chad Dawson, Tarvoris Cloud, Karo Murat, Sergey Kovalev, and Joe Smith Jr. The future International Boxing Hall of Famer fought a number of professional bouts in Atlantic City, which at times served as his home away from home in nearby Philadelphia. A particularly notable victory in A.C. came on June 10, 2006 when then 41-year-old Hopkins defeated Antonio Tarver for the IBO and The Ring World Light Heavyweight titles. Hopkins retired from boxing with a remarkable record of 55 wins, eight losses, and two draws. Virgil Hill Sr. - Hill first caught the attention of the boxing world as an amateur when he competed in the 1984 Olympic Games for the United States, and won the silver medal as a middleweight. Following his stellar performance in the Olympic Gamers, Hill turned professional and fought as a light heavyweight and cruiserweight from 1984 to 2007, before making a comeback to the ring in 2015. Over the course of his hall of fame career, Hill stacked up an impressive record of 51 wins and seven losses. A major career highlight came on September 5. 1987 in Atlantic City, when he defeated Leslie Stewart by TKO for the WBA World Light Heavyweight Title. Hill went on to defend his title ten times before losing it to boxing legend Thomas "Hitman" Hearns in 1991. He later recaptured this title in 1992 with a victory over Frank Tate, and successfully defended his belt ten more times between 1992 and 1997. On the tail end of his career, Hill also won the IBC and WBA titles in the cruiserweight division. He was inducted into the International Boxing Hall of Fame in 2013. Hill, a longtime resident of Atlantic County, New Jersey, has several ties with the Atlantic City boxing community. Along with winning his first and final world titles in A.C., Hill also worked out in area gyms, and had ACBHOF President and trainer, Ray McCline, work his corner for a number of bouts. Kevin Watts - Pleasantville, New Jersey's Kevin Watts fought professionally from 1983 to 1993. The middleweight fighter who went by the alias, "Killer," compiled an impressive record of 23 wins, seven defeats, and one draw, and fought all but five of these contests in front of his hometown fans. Watts had victories over Tyrone Frazier, John Scully, Tony Thornton, and Steve Darnell. He held the USBA and NABF Middleweight Titles during his ten year career. Iran Barkley - If you have found yourself in attendance at just about any of the boxing banquets, ceremonies, or commemoration events in the last few years throughout the tristate area, there is no doubt in my mind that you have run into Iran "The Blade" Barkley. In recent years, Iran, a fan favorite in and out of the ring, has become somewhat of an ambassador for the sport throughout the Mid-Atlantic states. Barkley, a native of the Bronx, is best known as the man who defeated Thomas Hearns for the WBC World Middleweight Title in 1988. The tough middleweight also got into the ring with a number of other notable pro fighters including, Roberto Durán, Michael Nunn, Nigel Benn, James Toney, and Trevor Berbick. Barkley is no stranger to Atlantic City, having fought his professional debut and 12 ensuing fights in the city. Between 1982 and 1999 he stacked up 43 victories, 27 of which came by way of knockout. John Brown - John Brown made his professional debut at Trump Castle in Atlantic City on June 8, 1989. This was the first of many appearances that the super featherweight contender made in front of his hometown fans leading up to his retirement from the sport in 2011. Brown fought Sugar Shane Mosley for the IBF World Lightweight Title in 1999. This was the first of four world title shots that the "Eastern Beast" had in the lightweight and super featherweight divisions during his long career. Brown retired after winning 24 of his 46 professional contests. Roberto Durán Sr. - If you never heard of Roberto Durán, you probably would not be reading this article! Durán had 119 professional fights between 1968 and 2001. One hundred and three of those fights were victories, with 70 (yes, you read that right) coming by way of knockout. The Panamanian, who was known as "Hands of Stone," was a world champion in four different weight classes. His resume of victories include wins over hall of famers Ken Buchanan, Carlos Palomino, and José Cuevas. Durán was the subject of the 2016 film "Hands of Stone." He was inducted into the International Boxing Hall of Fame in 2007. Micky Ward - Between 1985 and 2003, "Irish" Micky Ward fought 22 of his 51 professional fights in Atlantic City. Two of these contests were part of his legendary trilogy against Arturo Gatti in 2002 and 2003. The 2003 contest was named The Ring magazine fight of the year. The two wars fought between Ward and Gatti in Atlantic City were so popular with fans that a banner now hangs in Boardwalk Hall commemorating the fights. The Lowell, Massachusetts native was a light welterweight contender during his career and held the WBU Intercontinental Light Welterweight Title. Tim Witherspoon Sr. - Tim Witherspoon is a former world heavyweight champion who fought professionally from 1979 to 2003. He captured the WBC World Heavyweight Title with a victory over Greg Page in 1984, and the WBA World Heavyweight Title by defeating Tony Tubbs in 1986. He faced several notable heavyweights during his career including Alfonso Ratliff, Renaldo Snipes, Larry Holmes, James Tillis, Frank Bruno, James "Bonecrusher" Smith, James Pritchard, Al Cole, Andrew Golota, Brian Nielsen, and Lou Savarese. He was inducted into the New Jersey Boxing Hall of Fame and Pennsylvania Boxing Hall of Fame in 2008. He is the father of lightweight fighter Time Witherspoon Jr. and the cousin of heavyweight fighter Chazz Witherspoon. Ace Marotta - A fighter's best friend can be his or her cut man. One of the top cut men in the history of the fight game is Ace Marotta. The Totowa, New Jersey native worked with some of boxing's biggest names, and gained notoriety as manager Lou Duva's official cut man. Marotta worked with many world champions during his career including Rocky Lockridge, Johnny Bumphus, Livingston Bramble, Sean O’Grady, Davey Moore, Mike McCollum, Ayub Kulule, Evander Holyfield, and Mark Breland. Marotta was inducted into the New Jersey Boxing Hall of Fame in 1987. English "Bouie" Fisher - Bouie Fisher was a boxing coach who is most often associated with former world champion, Bernard Hopkins, who he trained from 1989 to 2002, and again from 2003 to 2005. Fisher was awarded the 2001 Eddie Futch-John F.X. Condon Award (top trainer of the year) from the Boxing Writers' Association of America. Fisher passed away in 2011 at the age of 83. He was inducted posthumously into the New Jersey Boxing Hall of Fame in 2015. Ronald "Butch" Lewis - Butch Lewis was a boxing manager and promoter, who is best know for serving as the manager of professional fighters, Leon and Michael Spinks. He promoted a number of fights, many of which were held in Atlantic City, between 1979 and 1996. He died on July 23, 2011 at the age of 65-years-old at his home in Bethany Beach, Delaware. Bobby Goodman - Bobby Goodman was a boxing matchmaker, publicist and promoter who currently resides in South Jersey. As a promoter, Goodman planned events for Main Bout, Bob Arum’s Top Rank and Don King Productions. He managed world champions Bob Foster and Ken Norton. In the early 1970's, Goodman joined Don King Promotions where he served as Director of Boxing. In this role, he promoted numerous major boxing events including the “Rumble in the Jungle” between Muhammad Ali and George Foreman; the “Thrilla in Manila” between Ali and Joe Frazier; The “Sunshine Showdown” with George Foreman and Joe Frazier, and the two fights between Roberto Duran and Sugar Ray Leonard. He later worked with Roy Jones, Jr.’s Square Ring Promotions. Goodman was inducted into the International Boxing Hall of Fame in 2009. Stan Hoffman - Stan Hoffman was a boxing manager who advised and/or promoted 38 world champions during nearly 50 years working in the boxing industry. Notable fighters who he worked with during his career included Iran Barkley, James Toney, Michael Benntt, and Hasim Rahman. He was inducted into the New York State Boxing Hall of Fame in 2017. 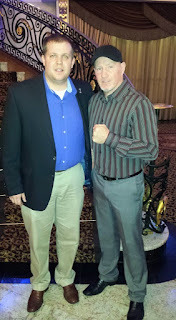 Nigel Collins - Nigel Collins is a respected, veteran boxing journalist from Pennsylvania. 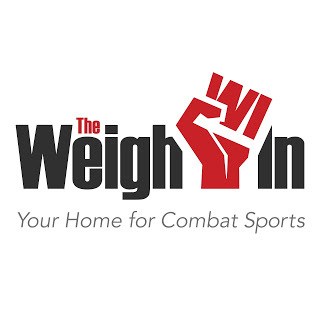 Before turning to boxing journalism, Collins boxed in the U.S. Army and managed fighters. Collins currently serves as a boxing writer for ESPN and is the former editor-in-chief of The Ring, KO, and World Boxing magazines. Collins is also the author of the 1990 book, Boxing Babylon. He was inducted into the International Boxing Hall of Fame in 2015. 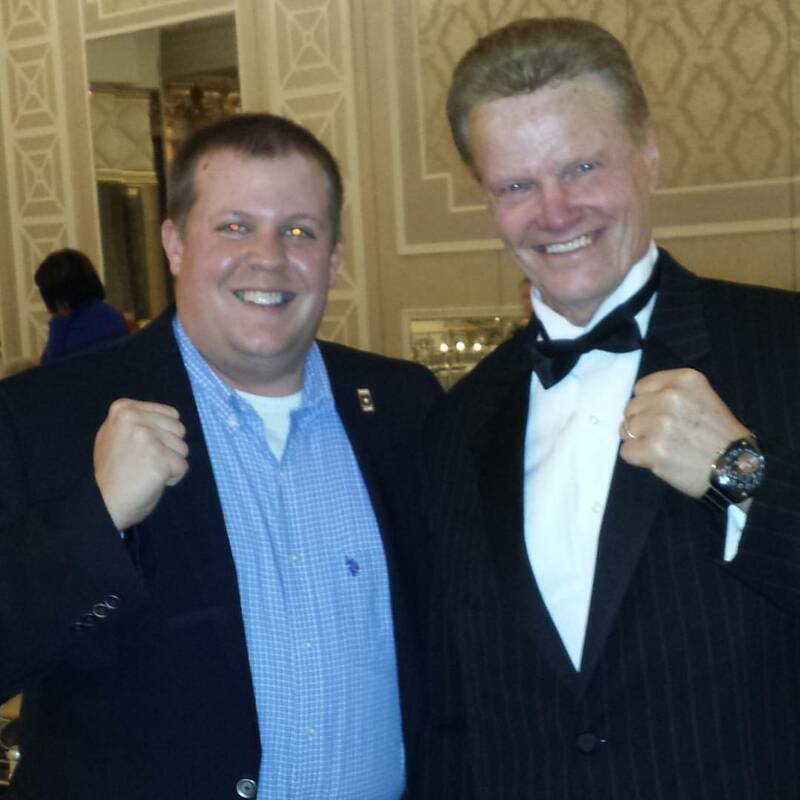 Henry Hascup - Hascup is the long-time chairman of the New Jersey Boxing Hall of Fame. A highly respected boxing historian, Hascup is also known as the uncrowned king of sports information. Sports writers and historians from around the country have sought out Hascup for his extensive sports knowledge. Hascup is a familiar face in the local boxing scene, having served as an MC and ring announcer for numerous regionally and nationally broadcasted boxing shows. Hascup is active in the Veteran Boxers Association (VBA)-Ring 8 in New York City and the International Boxing Research Organization (IBRO). He was inducted into the New Jersey Boxing Hall of Fame in 2010. 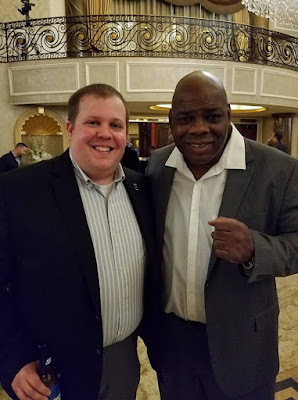 Jimmy Binns Sr. - Jimmy Binns has arguably the most interesting and diverse resume out of the 2019 Atlantic City Boxing Hall of Fame class. Binns, a high-profile lawyer from the City of Brotherly Love, served as legal counsel for the WBA, was the head of the Pennsylvania State Athletic Commission, and represented Rocky Balboa in the film Rocky V. As if that wasn't enough, Binns graduated at the top of his class from the Municipal Police Academy at Delaware Community College in 2013 at the age of 74-years-old. Tom Kaczmarek - "Tommy Kaye" has been a fixture in the world of boxing since he first stepped foot in the ring as an amateur in 1946. Between 1947 and 1949, he fought as a professional and compiled a record of 11 wins, five losses, and three draws. After stepping away from fighting, Kaczmarek became a boxing judge who judged thousands of matches, including hundreds of world and regional title bouts, before retiring in 2010. He was inducted into the New Jersey Boxing Hall of Fame in 1994. He is the author of You Be the Boxing Judge! : Judging Professional Boxing for the TV Boxing Fan. Tony Orlando Jr. - The Elizabeth, New Jersey native has worn many hats in the boxing industry beginning with his days as an amateur boxer including referee, judge, and chairman. Orlando started off as a referee in the amateur ranks, before transitioning to professional boxing in 1981. 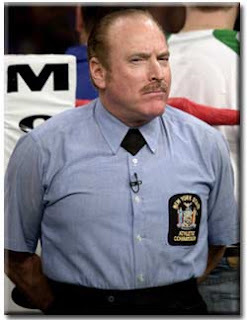 He served as a referee for numerous world title fights including the 1987 World Heavyweight Title fight between Mike Tyson and Tyrell Biggs in Atlantic City. Orlando currently serves as the Chairman of the New Jersey State Athletic Control Board. Along with his career in boxing, he worked as a fire fighter in the Elizabeth Fire Department. Orlando was inducted into the New Jersey Boxing Hall of Fame in 1991. Rhonda Utley-Herring - Rhonda Utley-Herring has served as the Deputy Commissioner of the New Jersey State Athletic Control Board since 2015. A native of Trenton, New Jersey, she has been involved in the state's boxing community since 1980 when she landed an intern position in the New Jersey Office of the State Athletic Commissioner. As a member of the commission, she has played an instrumental role in a number of initiatives that have improved the sport of boxing across the Garden State. She holds degrees from Rider University and Rutgers University-Newark. She was inducted into the New Jersey Boxing Hall of Fame in 2004. Stay tuned to The Weigh-In over the next few months as we provide further coverage on the dates, times, and locations of events associated with this outstanding boxing weekend, as well as information on ticket sales.